Imagine Entertainment was founded in 1986 by Ron Howard and Brian Grazer to create movies, television and other original programming. Since its inception, Imagine Entertainment has been honored with more than 60 prestigious awards, including 10 Academy Awards and 37 Emmys. Their past productions include the Academy Award-winning films A Beautiful Mind, 8 Mile, Apollo 13 in addition to The Da Vinci Code, and Curious George, and the Emmy and Golden- Globe-winning television series 24 and Arrested Development. Imagine Entertainment has a long standing production/distribution agreement with Universal Pictures. WGBH Boston is the number one producer of PBS content for TV and the Web, including such innovative, entertaining, curriculum-based children’s media as Arthur, Curious George (the most-watched show for preschoolers on American television, proven to boost understanding of science and math), Martha Speaks (and its Dog Party mobile app, with measurable impact on kids’ vocabulary), Design Squad Nation, Fetch! with Ruff Ruffman, Postcards from Buster, Between the Lions, and Zoom. These join such “produced in Boston, shared with the world” productions as Masterpiece, Nova, Frontline, American Experience, and Antiques Roadshow (PBS’s most-watched program). WGBH also is a major source of programs for public radio (including PRI’s The World) and a pioneer in educational multimedia and in technologies and services that make media accessible to the 36 million Americans with hearing or vision loss. WGBH has been recognized with hundreds of honors: Emmys, Peabodys, duPont-Columbia Awards…even two Oscars. Find more information at wgbh.org. The Universal 1440 Entertainment banner develops and produces live-action and animated productions directly for the home entertainment, television and the stage. Since its formation in 2005, the group has assembled an exceptional roster of animated family fare. including the brand-new animated feature-length home entertainment release The Little Engine That Could; the Daytime Emmy®-winning “Curious George” television series on PBS KIDS; and a string of hit Barbie movies, based on the world-renowned Mattel-branded doll. The group also has successfully built upon some of Universal’s highly celebrated live-action franchises, most recently launching the Tony Award®-nominated hit touring stage production Bring It On: The Musical; the adrenaline-fueled actioner Death Race 3: Inferno; and the epic-adventure saga The Scorpion King 3: Battle for Redemption. Projects currently readying for release include the all-new home entertainment features Dead in Tombstone, Curse of Chucky and Little Rascals, a reboot of the beloved family comedy. The group is part of Universal Studios Home Entertainment. 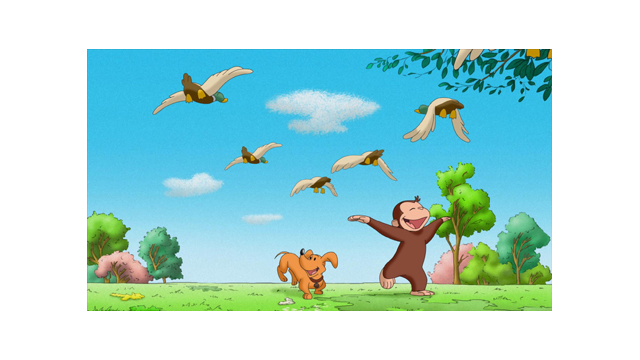 Curious George: ® & © 2013 Universal Studios and/or HMH. All Rights Reserved. FOR PROMOTIONAL USE ONLY.